What is the Consumer Music credit card? 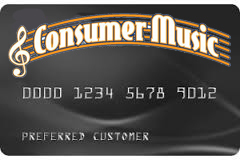 Consumer Music offers customers a credit card through Synchrony Bank with a revolving credit line to use again and again at Consumer Music. How can I make a payment on my Consumer Music credit card? Consumer Music offers three convenient ways to pay on your credit card account. Click here to log in and pay on your account. How do I get a Consumer Music credit card? You can apply in person at our location in Vallejo at 1017 Tennessee Street. Its a quick and easy application process. To check the status of your Consumer Music credit card, just click on the link above to go to Synchrony Financial’s website. After logging in, you will be able to check the status of your account, make payments, and update your account information. Mail payments to the address below with plenty of time for your payment to arrive by the due date. **Subject to credit approval. Minimum monthly payments required. See store or Click Here for details. We reserve the right to discontinue or alter the terms of this offer at any time. Credit is extended by Synchrony Bank.